My favorite part of the making beer process (besides tasting the final product) is probably the boil. It’s when I get to play the mad scientist adding all sorts of ingredients to make a magical tasting beverage. Of course there is a little bit of an order and process to the madness. So why exactly do we have do the boil? First off and most importantly, it’ll sanitize your beer. I think I’ve talked about sanitizing enough and why it’s important, but if I didn’t the short version is that if you don’t sanitize, you’ll probably end up having to pour your beer out because it’ll be undrinkable. Also the boil extracts aroma, bitterness and flavor from the hops or any other adjunct (ingredient) you might add. Plus, the boil will result in a more concentrated wort with a higher gravity. Most people start off homebrewing with a partial boil. That means that you’re only boiling 2-4 gallons of water, malt extract and hops. The rest of your five gallons of beer will come from water that is poured directly into the fermenter. I like doing a partial boil because I can use the five gallon brew pot that I have laying around the kitchen, using the kitchen stove. I don’t have to go outdoors or to the garage and use a propane stove. Since it’s a smaller amount of wort boiled, it also means that it’ll be quicker to cool down. It means that I won’t need any special equipment (although a wort chiller does make life easier), I can just cool down my wort in an ice bath. Don’t wake away from your wort, especially when it’s just getting started. They do have a tendency to happen and they do have a tendency to get very messy. To extract the most from your hops and adjuncts, a full rolling boil is required. And I just learned this when I was doing some research for this article. Don’t put the lid on the pot during the boil. Leaving the lid on can cause off flavors in your beer because it traps in compounds that would normally disappear from your wort with the steam. 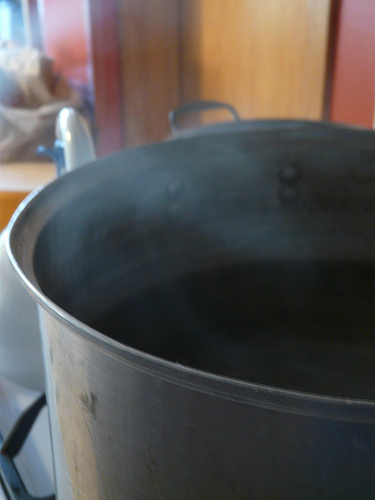 Stay tuned, soon I’ll go over exactly what to put into your boiling wort, when and why.